Before he passed into Mahaparinirvana, Buddha Shakyamuni prophesised that in eight (or twelve) years he would send an emanation to continue his activity, protecting the teachings and turning the wheel of Vajrayana. In the southwest of the land of Uddiyana (around the present day border between Pakistan and Afghanistan), there lay the great lake Danakosha, ‘Ocean of Milk’. Through the blessings of Buddha Amitabha, a beautiful lotus flower of many colours blossomed in the centre of the lake, upon which appeared a golden vajra. In the centre of the vajra, a syllable Hrih appeared, emanated from the heart of Buddha Amitabha. The syllable and vajra were immediately transformed into a small boy around eight years of age, sitting in the centre of the lotus. Bearing all the major and minor marks of physical perfection, he began to give teachings to the gods and dakinis around the lake. “I came from the unborn state, the dharmadhatu. My father’s name is Samantabhadra and my mother’s name is Samantabhadri. Overcome with joy, the king invited the boy to return with him to the palace as his adopted son and crown prince. Having accepted, the child was named Padmakara, or Padmasambhava (Pema Jungne in Tibetan), meaning the ‘Lotus Born’. The kingdom prospered and the king and his subjects enjoyed a time of joyful abundance and peace. Padmakara received an education befitting a crown prince, while at the same time bringing countless beings to spiritual maturity through his games and youthful play. He then married the dakini Prabhavati and ruled the kingdom according to the Dharma. However, realising that he could not accomplish great benefit for others in his role of king, and his father having denied him permission to abdicate, he decided to seek other means of leaving. While playfully dancing on the roof of the palace he loosened his grip on the trident he was holding, causing it to fall from the roof onto the son of a wicked minister, killing him outright. Unaware that Padmakara had actually liberated the boy’s consciousness, the king had no choice but to sadly banish him to the fearful cemetery of Sitavana. At Sitavana and other charnel grounds such as Sosadvipa, he performed esoteric exercises, received empowerments from dakinis and accomplished the common and uncommon siddhis, bringing hosts of dakinis under his command and becoming known as Shantarakshita (Guardian of Peace). He then journeyed to Lake Danakosha, where he spoke to the dakinis in their own tongue, thus bringing them too under his power. Pursuing tantric conduct in Parushakavana charnel ground, he was blessed by Vajravarahi. He bound the nagas of the oceans and the planetary demons of the heavens to obedience. Wisdom dakas and dakinis of the three places bestowed empowerment upon him, and he became known by the name Dorje Drakpo Tsal (Vajra Mighty Wrath). He then travelled to the Vajra Seat in Bodh Gaya and performed miracles, causing people to enquire who he was. When he replied that he was a naturally occurring buddha, they could not believe it and instead reviled him. He travelled to many places, manifesting the appearance of receiving teachings from many scholars, accomplished masters and dakinis. In the country of Sahor he took monastic ordination and became known as Shakya Simbha (Lion of the Shakyas). He heard teachings on the Yoga Tantras some eighteen times, whereupon he had visions of the deities. When he requested empowerments from Anandi, the dakini Guhyajnana manifesting in the form of a Buddhist nun, she transformed him into a Hum syllable and swallowed him. Passing through her body, he received the outer, inner, and secret empowerments in their entirety before emerging from her lotus. He received the The Eight Sadhana Teachings (Kagyé, sometimes translated as The Eight Commands of Sadhana Practice or, The Great Sadhana of Eight Mandalas) from the eight great masters of awareness: Manjushrimitra, Nagarjuna, Humkara, Vimalamitra, Prabhahas, Dhanasamskrita, Rombuguhya, and Shantigarbha. From many other learned and accomplished Indian masters, he received teachings on all of the Sutras, Tantras, and other fields of knowledge. Learning all these through seeing them only once, he became known as Loden Chokse (Intelligent Seeker of the Sublime). Without having to meditate he beheld mandalas of deities and attained the first of the four levels of Awareness-Holder, that of ‘Awareness Holder with Residue’. At this time he captured the heart of Princess Mandarava, the daughter of the King of Sahor, who was practising as a nun in solitude. Outraged, the king had Padmakara burnt alive on a huge pyre. Through his power of siddhi and in order to subjugate the king, Padmakara transformed the fire into a lake and the wood into a lotus, upon which he was found sitting the next day. Overcome with faith and remorse, the king offered Padmakara his own royal garments and lotus crown (attire in which Guru Rinpoche is most commonly depicted). Bestowing many teachings upon the king and his subjects, Padmakara then departed for Nepal, with Princess Mandarava as his consort. At Maratika Cave they spent three months performing the sadhana of long life, receiving empowerment and blessing from the Buddha of Infinite Life, Amitayus. They actualised the immortal vajra body and attained the second level of Awareness-Holder, that of ‘Awareness-Holder with Power over Life’. The master and his consort then returned to Uddiyana disguised as beggars collecting alms. However, Uddiyana being his homeland, it wasn’t long before Padmakara was recognised as the crown prince who had killed the son of the minister. Having defied his banishment, the master and Mandarava were sentenced to being burned alive in a huge sandalwood fire. When the fire was lit, Padmakara miraculously transformed it into a huge lake filled with lotuses. The master was seen, seated with his consort on a giant lotus in the middle of the lake, bedecked in a miraculous garland of skulls symbolising the liberation of beings from samsara. The king, ministers, and people were astounded and developed great faith in him, and he became known as Pema Thötreng Tsal (Lotus Mighty Garland of Skulls). Padmakara remained in Uddiyana for thirteen years, acting as the king’s spiritual adviser and bringing the entire kingdom to the Dharma. He conferred the maturing empowerments and liberating instructions, and the king, queen, and many others with fortunate karma attained supreme realisation and the rainbow body. He became known as Padma Raja (Lotus King). He then manifested as a Buddhist monk named Indrasena, in order to guide the great King Ashoka. The king was duly converted and spread the Dharma far and wide. Around this time there were several rulers with extreme anti-Buddhist views. When one king tried to have Padmakara poisoned, the master was not harmed and when he was cast into the Ganges River, he flew into the sky, dancing. He became known as Khyeu Khadeng Tsal (Young Mighty Garuda). He went to great charnel grounds such as Kula Dzok, where he gave dakinis teachings on the secret mantra. He captured the life essence of all arrogant gods and demons, both outer and inner, and compassionately bound them to serve as guardians of the teachings. When performing such deeds, he was known as Suryarashmi (Rays of the Sun). After he had defeated five hundred scholars of extreme views in debate at Bodh Gaya, they then began to use black magic against him. Turning their magic back upon them, he liberated their minds into basic space and converted the whole area to Buddhism. He became known as Simbhananda (Lion’s Roar). He returned to Nepal and took as his consort the princess Shakyadevi, daughter of the Nepalese king Kushaladhara. While they were practising Yangdak Heruka at Yangleshö Cave (in what is now known as Pharping), three powerful demons began to cause a blight on the land. No rain fell and disease and famine spread. Padmakara sent emissaries to India to bring the Tantras and explanatory commentaries relating to the deity Vajrakila, and as soon as these texts arrived in Nepal, the obstacles were immediately pacified. Padmakara and his consort achieved the third level of Awareness-Holder, that of ‘Awareness-Holder of Mahamudra’. Hearing this, Padmakara (who by this time was a highly accomplished siddha), journeyed instantly by his miraculous powers to the great charnel ground of Parushakavana. Supplicating and prostrating to the master Shri Simha, he asked to be accepted as a disciple. Shri Simha bestowed upon Padmakara the entire transmissions of the Semde (Mind), Longde (Expanse), and Me-ngagde (Instructions) cycles of Dzogchen. After receiving these he again supplicated Shri Simha, requesting the ultimate instructions on the dissolution of the mortal body and the attainment of buddhahood in the pure realm of dharmakaya. Shri Simha was delighted and bestowed the empowerment and instructions of the most secret unsurpassable Dzogchen cycle of Khandro Nyingthig (The Heart Essence of the Dakinis) upon Padmakara. Padmakara remained with Shri Simha for twenty-five years, and then went to the great charnel ground of Sosadvipa and practiced for three years, achieving the rainbow body of great transformation. No longer subject to birth or death, he dwelt in the body of light, appearing in various forms according to the needs and capacities of those to be guided. It is said that by the time he was invited to Tibet in the ninth century, Guru Rinpoche was over a thousand years old. He travelled all over India and beyond, benefitting countless human and nonhuman beings. In particular, by day he served as the Guru to the Indian king Dharmapala, while at night he travelled to great charnel grounds such as Shitavana, Sosadvipa, Prabhaseti, Nandana, Bhasing, Tachung, and Bhairava. There he stayed, engaging in tantric activities, together with hosts of radiant dakinis. In accordance with this advice, King Trisong Detsen sent seven emissaries to invite the great Lotus Born master to Tibet. Having foreseen this, Padmakara had already set off towards Tibet and met the king’s attendants at the border. Turning them back, he entered Tibet alone. Through his enlightened power he travelled the length and breadth of the three provinces of Tibet, displaying miracles and binding the powerful local deities and demons to oaths to protect the Dharma and its practitioners. After having met the king, he flew into the sky and commanded all the arrogant spirits to help, rather than hinder the construction of Samye. So with human and non-human assistance, Samye was quickly completed without further difficulty. Amongst wondrous signs, such as flowers falling from the sky, statues moving as if alive and amazing displays of light and music in the sky, the great master Padmakara and the abbot Shantarakshita consecrated the new monastery. The people were overcome with faith, peace and joy. One story relating to the history of this period concerns previous lives of the three great beings; King Trisong Detsen, Guru Padmakara, and Abbot Shantarakshita. It is said that the three of them and another boy had all been brothers, whose mother had the aspiration to build the Great Stupa at Boudhanath in Nepal. With their help her wish was fulfilled, and at the completion of the stupa the four brothers had made a commitment: to take rebirth as a great Dharma King, a great tantric master, a great abbot, and the king’s messenger. In fulfilment of their sincere prayers, the Buddhist King, the Master, and the Abbot illuminated the entire Land of Snows with the unique, positive influence of the precious teachings. Under their patronage and that of Vimalamitra, Vairotsana and other Indian and Tibetan masters, scholars and translators, the Buddhadharma was firmly established in Tibet. One hundred and eight great scholars of the Indian Buddhist tradition were invited to Tibet, as were many groups of scholars from such regions as Khotan, China, and Zhang Zhung. All the sublime teachings of the Buddha existing at that time – Sutras, Tantras, and the commentaries on their intent by other masters – were translated without omission into the Tibetan language. Shantarakshita ordained seven young Tibetans as monks, known as ‘the seven testers’, to see if Tibetans would be able to keep to the path of discipline. At their success, they were followed by hundreds of others. At the same time, through teaching the path of secret mantra to lay people, Guru Padmakara established the community of white-robed, long-haired lay practitioners who maintained the tantric tradition. Guru Padmakara then held three great gatherings of those with the most fortunate karma, extraordinary students such as the twenty-five who were his intimate disciples, among them the king of Tibet and his close subjects. At the first gathering, he bestowed The Gathering of Sugatas (a cycle focusing on The Eight Sadhana Teachings); at the second, The United Intent of the Gurus; and at the third, The Gathered Commands: An Ocean of Spiritual Teachings. In these and other ways, he bestowed upon these disciples countless empowerments, sadhanas, Tantras, explanatory commentaries, and pith instructions. In gratitude for what he had received, King Trisong Detsen offered Guru Padmakara his own Queen, the dakini Yeshe Tsogyal, as consort. He also offered his entire kingdom and all within it, including his retinue and subjects. Foremost among the twenty-five intimate disciples were the Guru’s nine heart children: King Trisong Detsen, Yeshe Tsogyal, Sangye Yeshe of Nup, Gyalwa Chokyang, Namkhai Nyingpo, Jnanakumara, Palgyi Yeshe, Palgyi Senge, and Vairotsana. Padmasambhava also saw that certain teachings would be particularly beneficial to future generations. He therefore entrusted many teachings to King Trisong Detsen, Yeshe Tsogyal and others of his twenty-five main disciples, ‘sealing’ the instructions within their awareness (sometimes called the Mind-Mandate Transmission) for the future benefit of beings. With their assistance (especially that of his disciple and consort, Yeshe Tsogyal) he then also concealed these teachings as treasures in various places – rocks, lakes, temples, ritual objects and even in the sky. At the appropriate time in the future, either spontaneously or with the support of these hidden treasures, the mind-mandate awakens in the awareness of the tertön (treasure-revealer). The teachings then reveal themselves within the understanding and realisation of the tertön, who is then able to use them to benefit others. Guru Rinpoche made prophesies regarding the future manifestation of these treasures, including the tertön, the Dharma-protector of the treasure, and the time of its revelation. Each terma is uniquely suited to the times in which it is revealed, and to the particular needs and capacities of its recipients. The Terma Tradition is often called the ‘short lineage’, due to the direct nature of the transmission from Guru Padmakara to the practitioner of the terma. In particular, Padmakara transmitted and entrusted the Dzogchen Nyingthig, including the Khandro Nyingthig, to Yeshe Tsogyal. He also transmitted the Khandro Nyingthig to Princess Pemasal, the daughter of Trisong Detsen, at Chimphu. The young princess had tragically died at the age of eight, due to a karmic obstacle, but was briefly brought back to life by Guru Padmakara. He imparted to her the mind-mandate transmission of Nyingthig, her Dharma inheritance. She then passed away, and after many incarnations was reborn as the tertön Pema Ledreltsal (1291-1319? ), who revealed the Khandro Nyingthig. Her next tulku was Longchen Rabjam (1308-1363) who, as can be seen from his life story, was of major significance to the Dzogchen and Nyingma lineages. Through his miraculous power, Guru Rinpoche journeyed throughout the entire land of Tibet and blessed all the mountains, lakes and caves as places for accomplishment. With Yeshe Tsogyal, he performed sadhanas, gave blessings and left signs of enlightened body speech and mind for future generations. He also travelled to what is now Bhutan, concealing treasures and binding spirits to protect the Dharma, becoming known as Dorje Trolö (Wrathful Vajra). After King Trisong Detsen passed away, he was succeeded by Prince Mu-ne Tsepo. His reign only lasted a very short time and he was succeeded by his younger brother, Prince Mutik Tsepo. In 864, after staying fifty-five years in Tibet and heedless of his disciples who implored him to remain, Guru Rinpoche journeyed to the Kungthang Pass in readiness to depart. He was accompanied by King Mutik Tsepo and a huge number of followers, who couldn’t believe that the beloved master was leaving. He sang his last verses of advice and then flew up into the sky and away to the west with Yeshe Tsogyal, amidst a host of celestial beings, light rays and musical praises. 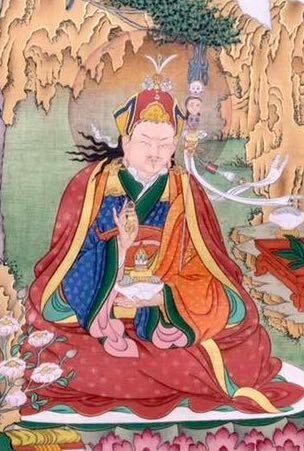 He set Yeshe Tsogyal down at Tsawa Rong Cave, and in response to her lament, he lovingly gave her his last advice before finally departing for Zangdok Palri (‘The Copper Coloured Mountain’, Guru Rinpoche’s manifested pure land in Chamara, a subcontinent to the southwest of our world).